Minimum rental period of 30 days/29 nights. Renovations recently completed, including updated original bath, new furnace, central air conditioning and sleeping porch made '4 season'. 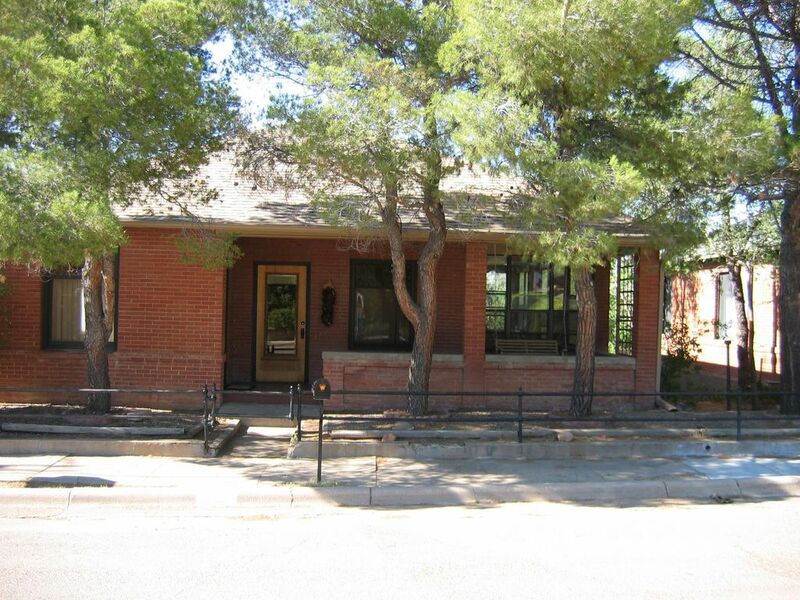 This wonderful vacation house is centrally located in the historic district of Silver City, within easy walking distance to restaurants, galleries, the public library, Western New Mexico University and food co-op. The house includes living room, dining room, kitchen, family room, two bedrooms, 2 baths, four- season enclosed porch, deck and covered front porch. The rent includes all utilities; a security deposit is required. This non-smoking vacation rental is comfortable for 4 (one queen bed, one full-size, inner-spring futon). Second bedroom also works as an office/den. Well-behaved dog considered. Please email for additional information. Security deposit is $650. Cleaning fee of $100. We live in Maine and hope to spend most of the year in Silver City when we retire. We fell in love with this house on our second trip to Silver City. The location in the historic district is great, within walking distance to just about everything. The house has a comfortable layout that feels spacious. We enjoy the privacy of the walled backyard, but we also like to sit on the covered front porch and and say hello to the neighbors and people just passing by. We've furnished and equipped the house so that we will enjoy vacationing there, and are happy to share it with others who appreciate Silver City. Short walk to the charming downtown, university, library and Boston Hill Open Space. Rental Rate includes: All Utilities; Wireless internet; Cable TV with HBO and Netflix, DVD/VCR player; Fully equipped kitchen/linens/towels; Dishwasher/washer/dryer; Radio/CD Player and I-Pod Player. This was our second satisfied stay at this house in Silver City's historic downtown neighborhood. The location is perfect for visitors to the city: within walking distance to shops, galleries, restaurants, parks, the university, the library and many walking/hiking trails. The house itself is a comfortably remodeled older house with lots of character, plus modern conveniences and very well maintained. For us the enclosed back yard was a real plus for our small dog, too. The owner has been excellent to work with: fair, responsive and prompt with any concerns or questions we had. All in all, it's a great home base for visiting the Silver City area. Gary and Pat: So glad you enjoyed your stay. It's a pleasure hosting you. Thank you and take care. My husband and I really enjoyed our three months in this house; so much so we have reserved it again for next year! The older, renovated home is charming and comfortable with both vintage and modern features, and the location is perfect: two blocks from the library and walking distance to the historic downtown, the college and the Boston Hill hiking trails. The enclosed back yard was perfect for our small dog, too. The owner and her local property manager were wonderful to work with; responsive and helpful. All in all, this house was a great place to spend our winter months. Of the three long term VRBO homes we have rented in downtown Silver City, this home was the best. The location was quiet and central, just two blocks from the library. We enjoyed the renovated rooms---a bathroom with a walk-in shower, the modern and functional kitchen, and a comfortable sitting area with windows looking into the home's private back yard. The owner and property managers were responsive and helpful. Hiking in the Gila wilderness, occasional hot springs soaks, crossing the border for lunch at the Pink Store in Palomas, and classes with the Western Institute of Lifelong Learning kept us busy. We enjoyed our stay so much we bought a home and are moving to Silver City! I appreciate your kind words and the good care you took of the house. Congratulations on your home purchase, and I look forward to seeing you in Silver City! This is my second time renting the house. It met all of my needs in terms of convenience, amenities, and comfort. I love the overall character, furnishings, and charm of this well-maintained home. Management dealt with questions and issues promptly and professionally which added to a perfectly enjoyable stay. I readily recommend this property whole-heartedly. I stayed here for 9 weeks during a work assignment in Silver City. The house had everything I needed for my extended stay, with a grassy walled in backyard for my dog. The house has high quality furniture, a very comfortable bed, nice linens, large lovely bathrooms and a washer/dryer in the basement. Nice TV, decent internet, porch swing. It is up on a hill and the "family room" has a wall of windows with a nice view of the mountain and church steeple. It was great to be able to open up the doors to the sleeping porch at night to let the cool New Mexico air in. The house was very clean and well-maintained and is in the best neighborhood in town - lots of historic homes, a two block walk to the Saturday Farmers Mkt, a few blocks walk to the University, a few blocks to downtown, restaurants. I would definitely stay here next trip!! Thanks for your very thoughtful comments and for taking the time to write. As you know we are here enjoying the house for a couple of weeks ourselves and have upgraded the internet service and installed a smart TV. We've also had insulation blown into the attic so it will be cozy when the weather gets cooler. You would be welcome back any time. Very comfortable, handy to everything..
shops, restaurants, etc. Everything worked perfectly, and the caretaker lady was close by and quite helpful. Thanks, it was a pleasure to have you. Hope to host you again in the future. Located in southwest New Mexico, (elevation approx 6000 ft.), Silver City was named one of '20 Dream Towns' by Outside Magazine. Other publications have recognized it as one of the 'Hundred Best Small Art Towns', 'Top Retirement Spots', and '100 Best Small Towns'. Silver City enjoys four gentle seasons and offers outstanding hiking, biking, riding and birding. Silver City is a diverse, welcoming community with a distinct small-town, friendly feel. Check out why many are choosing Silver City as an ideal retirement spot. Silver City is the Gateway to the Gila National Forest recreational area. Please inquire by email for more information and ask any questions. Thanks. Fees include all taxes. Minimum rental period of 29 nights ($50 per night). Security deposit is $650. Cleaning fee of $100. This vacation rental is available on a MONTHLY basis only, no daily or weekly rentals. If reservation is cancelled 90 days or more before start date, amount paid will be refunded less a $250 processing fee. If cancelled with less than 90 days notice, amounts paid are not refundable unless the property can be re-rented and a $250 processing fee applies. Fees charged by this vacation rental site are not refundable. No parties or events allowed; No smoking. No additional overnight guests except those listed on itinerary.